Do you truly know your personal risk tolerance? One measure of portfolio risk is volatility. Most investors do not have a clear sense of how to quantify their own risk tolerance or how to measure the risk of their current portfolio. Many investors don’t understand how their assets could be impacted by an increase in interest rates, a large sell-off in the stock market or another major financial crisis. What you will learn about yourself…and your portfolio. Quantitatively Pinpoint Risk --- Use leading scientific theory, objectively pinpoint your Risk Number®. The Risk Number is a proprietary scaled index developed by Riskalyze to reflect a risk score for both your unique fingerprint or for a particular portfolio of investments. 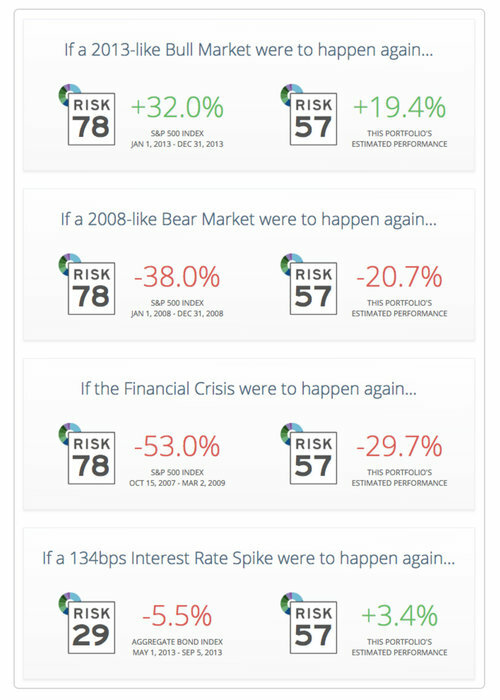 One of the most important drivers of the Risk Number is the measurement of downside risk. Riskalyze, based in Northern California, provides the tools to our firm to capture a quantitative measurement of investor risk tolerance. Their unique and patented Risk Fingerprint technology is a purely quantitative approach, built on the academic framework that won the Nobel Prize for Economics in 2002. (Known as the “Prospect Theory”, it was developed in 1992 by Daniel Kahneman and Amos Tversky as a psychologically more accurate description of decision making by modeling real-life choices.) How about we remove all of that subjectivity and let the math speak for itself. Many investors have questions and concerns around a central theme: "how would my portfolio perform if ________ happened?". With Riskalyze, you now have the capability to gain a deeper understanding of the effects of these scenarios. Portfolios can be stress tested for a variety of financial market scenarios. Stress tests are not simply a rear view mirror or historical snapshot. The Riskalyze stress tests display how the portfolio would likely perform, in the future, if a similar market period were experienced. Please try out the Risk Number tool; the short survey of 8-10 questions can be completed in less than 2 minutes. For a complete portfolio risk assessment, including stress testing, an expense analysis and retirement mapping, please call 800-518-6686 for a fifteen minute confidential conversation to receive your personalized report.